With the markets taking a breather over the past couple of months, some stocks are looking attractive. Here are three stocks to consider. As we head into the holidays, investors could find themselves with an attractive opportunity to scoop up shares of stocks that have been battered over the past couple of months amid trade disputes between the U.S. and China and general concern that the market's almost 10-year bull run might begin to lose momentum. 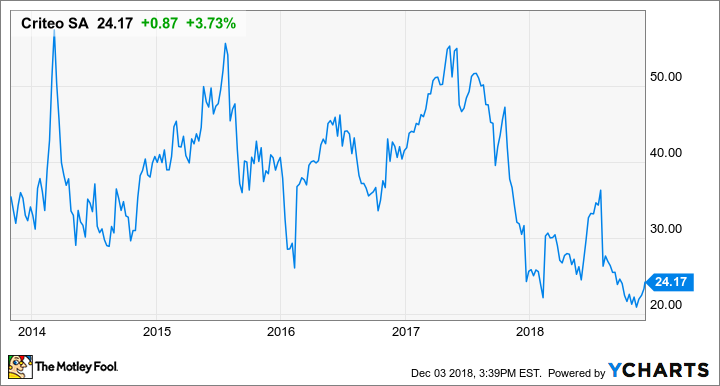 We asked three Motley Fool contributors which small-cap stocks had their eye in December, and they responded with Criteo (NASDAQ:CRTO), Uxin (NASDAQ:UXIN), and First Commonwealth Financial (NYSE:FCF). Daniel Miller (Criteo): If you're looking for small-cap stocks to buy in December, and are willing to take on some risk, take a look at Criteo. Shares in the online ad targeting specialist have plunged over the second half of 2017 and throughout 2018. Criteo's tough year was warranted as governments and consumers have been grilling companies about how personal information online is being collected and shared by advertisers, interested retailers, and other companies. That has obvious negative implications and adds uncertainty around Criteo's business, which uses your online behavior to determine what ads you would be most interested in and would make you more likely to purchase products or services. Despite the uncertainty and headwinds surrounding the company, investors have an opportunity to scoop up shares on the cheap this December, especially considering Criteo's solid third-quarter results. Its top-line revenue fell in line with guidance, and its adjusted earnings before interest, taxes, depreciation, and amortization (EBITDA) topped guidance. The company also announced an intriguing acquisition and a new share-repurchase authorization, which hints that management believes its stock is cheap and possibly poised for a rebound. Criteo's acquisition of Manage, a provider of an app installation advertising solution, expands Criteo's client base in retail and travel, but also opens up new opportunities in gaming, food delivery, and ridesharing. The acquisition also brings in technical and commercial talent that can boost the company's overall development, while Criteo offers Manage global scale and an extensive client base. Criteo's client count increased 11% during the third quarter, compared with the prior year, and its client retention remained near 90% for full-funnel products -- suggesting it offers compelling advertising solutions. However, Criteo's stock is cheap for a reason: uncertainty regarding personal information and how it's shared. But for investors who can stomach risk, December offers a chance to scoop up shares on the cheap, and if Criteo can continue to expand its client base and acquire intriguing businesses, the future could be bright. Jeremy Bowman (Uxin): Chinese stocks have gotten banged up in recent months on concerns about slowing economic growth and trade tensions with the U.S. as President Trump has slapped tariffs on a range of products, including steel, aluminum, and washing machines. As a result, Chinese stocks have suffered, with the Shanghai Composite down more than 20% year to date. One small-cap victim of that sell-off has been Uxin, China's largest used-car e-commerce platform. Uxin debuted on the public markets at $9 in June, but the stock has steadily fallen since then amid those broader concerns, and is now down about 70%, trading below $3. Indeed, Chinese car sales are plateauing after a period of strong sustained growth, but it's a mistake to dismiss Uxin purely on macro issues. As the leader in online used-car sales in China with about 40% market share, the company is building an economic moat through a business that has network effects and switching costs for dealers. With the biggest network, Uxin should naturally attract more buyers and sellers than competing platforms, and its recent growth has been impressive: Revenue jumped 59.6% to $125.5 million in the third quarter, beating the company's own guidance. Uxin is not yet profitable as it spends nearly all of its revenue on sales and marketing, a common practice for fast-growing companies. However, it should deliver profits once it matures since the e-commerce marketplace model generally offers high margins, as the success of companies like eBay, Alibaba, Grubhub, and Etsy shows. Uxin shares should continue to be volatile given the Chinese macro environment, so it may not be a good choice for risk-averse investors, but with shares trading at a steep discount, now looks like a great time to buy. Jordan Wathen (First Commonwealth Financial): This small bank is based in Indiana, Pennsylvania, making its money providing banking services to commercial clients and consumers in the American Rust Belt, primarily through branches located in Western Pennsylvania and Eastern Ohio. The bank plays it close to the chest, filling up its balance sheet with commercial real estate and business loans. Riskier construction loans make up only about 5% of total loans. Management is also incentivized to focus on the metrics that really matter, with their bonus compensation determined by a formula that puts emphasis on holding down expenses and generating an attractive return on assets. A $7.7 billion balance sheet makes it large enough to underwrite larger loans for commercial clients, but small enough that its small-business customers won't be lost in the shuffle as they might be at a massive super-regional bank like PNC Financial Services. As the banking industry continues to consolidate, the smaller institutions that remain should benefit from less competition for small-dollar business loans. Shares are attractively priced at about 13 times what the bank could reasonably earn in 2018. The bank recently authorized a share-repurchase program to take advantage of attractive prices, which could bode well for shareholders as it slowly reduces its share count.